Nice computer graphics or simulations are a good start, but nothing is like having your product in hand. Unlike most design companies we possess our own workshop. This way we can always test the solutions, search for improvements and working designs. The feedback we get from production prototyping is crucial in order to meet our goal: Engineering – delivered. Our workshop has a turning, drill, cutting, tapping equipment and, most importantly a modern CNC Machining center with 4 axis. 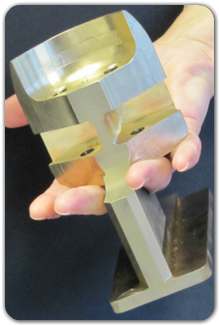 Our competence in machining includes both metals and plastics. In metal we process both corrosion resistant AISI 316, AM7-bronze and soft magnetic materials, but mostly we are machining in aluminum. We hold a small stock of sophisticated materials like PEEK, Oilon and PPO as well as standard engineering materials like POM, ABS and PA.
For actuator purposes we have winding machines with self-bonding copper wire for making motor and sensing coils. If you already have designed, or is nearly finished with designing your product and parts, we might be able to enhance the performance or produce ability and give you your design in hand very quickly. Give us a call today and let us help enhance your ideas, your design and your production.